In late September or early October, a tall stem bearing a frilly red flower suddenly pops out of the ground. 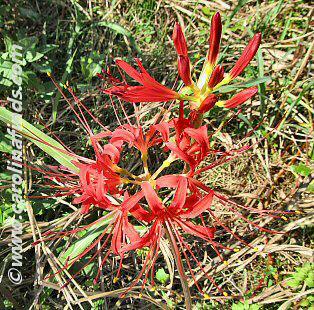 It’s fall and Spider Lilies- Lycoris Radiata- are in bloom in the South. Spider Lilies were brought to the United States in the 1850’s from Japan. They are hardy, easy to grow perennial bulbs that don’t have to be dug up each year. First the flower bearing stem appears, then when the flower begins to die, slender dark green leaves appear at the base of the stem. These leaves will remain green all winter, dying back in early summer. As tempting as it may be to cut the leaves when spring arrives, it’s best to wait until they begin turning yellow – they are feeding the bulbs for next years’ blooms. Spider Lilies can be planted any time of the year, but it’s best to divide or move them in the spring when the leaves are dying. Although spider lilies don’t like to be disturbed – it may cause them to not bloom the next year – they also don’t like overcrowding – which may cause blooming issues as well. It’s not at all unusual to dig up a shovel full and find fifty or more assorted sized bulbs. Even undisturbed bulbs may refuse to bloom at times. When driving around in the fall, take note of old homes and you’re likely to see spider lilies. The bulbs can still be ordered but if you are fortunate enough to know someone who has bulbs, maybe they will share a few with you as they can be hard to find and fairly expensive. The bulbs in my yard have probably been around for well over fifty years and I don’t actively take care of or feed them other than to occasionally dig a clump to share bulbs with someone. I always have beautiful blooms, and if I made the effort to thin them, feed them occasionally I’m sure they’d be quite an attraction. As a low maintenance fall blooming flower, I’d definitely recommend planting spider lilies. They are great for naturalizing, borders or scattered randomly though out a yard. They make a show, give green foliage when most other foliage is dead, then disappear for the summer, waiting for fall to come so they can bloom again.